Its outer shell is made of phenolic, while its internal part is made of stainless steel. Process gauge is used for processing food and refrigerating and other engineering territories. Process gauge is easily adjustable with the self-locking micrometer pointer. Its socket is date-coded to ensure pedigree. And there are wetted parts printed on the dial. Ma Anshan Exact Instrument Co., Ltd is a professional manufacturer of v instruments. 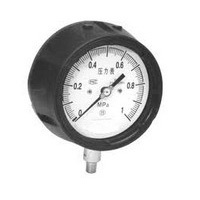 Our company specialize in designing and manufacturing electrical contact gauge, process pressure gauge, absolute pressure gauge, diaphragm pressure gauge, CNG pressure gauge, industrial thermometer, safety pattern gauge, case, movement, pocket, connection and so on. Our Process gauges are widely used in oil, chemical industry, metallurgy, electricity, manufacture, papermaking, food, energy, etc. Our Process gauges have been exported to U.S.A, Canada, Europe, Spain, Egypt and South-east Asia, mid-east and so on.